I went to the MELT event @ the Mirror sim. The installation is pretty cool, except getting to the event was rather difficult because 1. It’s on a homestead sim, and 2. I was trapped under ice when I tp’d, I kept trying to go “UP” when someone told me that I actually need to stay below the ice to shop. Once I found the shop though, I couldn’t get inside so I had to sit on one of Miabella Foxley’s beds to get “IN”. Once I was in, I bought the bed! Yay new bed…. I hope I’ll remember to use this somewhere. Anyways, there are lots of cute stuff to purchase but I fell in love with Magic Nook’s cute accessories. Ayumi Cassini’s stuff was super affordable and they come in PINK! Since I’m trying to keep my skin addiction under control, I only bought “accessories” and passed up on the skins (for now). 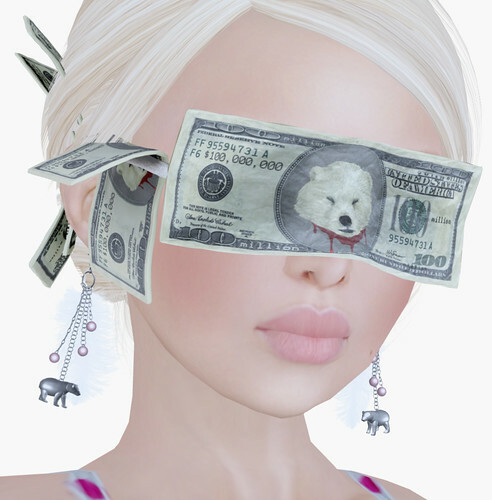 I also bought the Surf Couture ‘Hundred Million Dollar Blindfold because I really like the message behind it. Every time you buy something you don’t need in SL, a polar bear is decapitated. JUST KIDDING! That’s not the message. But it would make a fantastic accessory for any fabulous SL stripper.